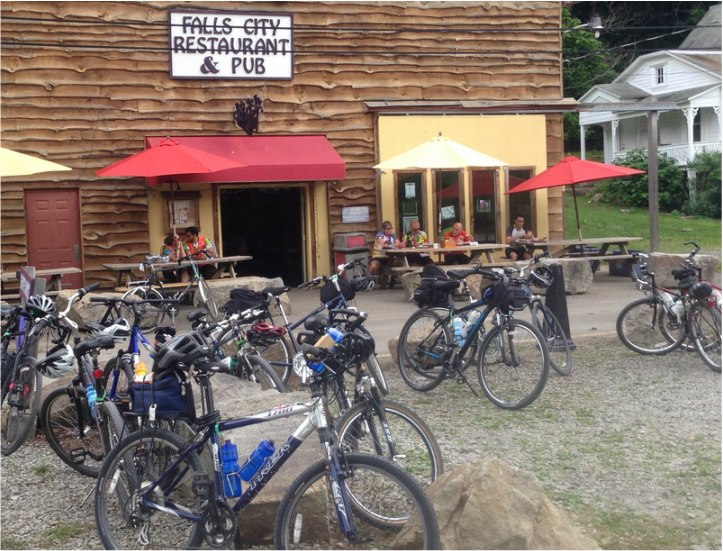 The Falls City Restaurant and Pub is located 200 yards from the Great Allegheny Passage (GAP) Rail Trail, which runs through Ohiopyle State Park and the town of Ohiopyle, PA. The Great Allegheny Passage is a multi-use pedestrian path that winds 150 miles through the mountains of Southwest Pennsylvania and connects Pittsburgh, PA to Cumberland, MD. Past Cumberland, the GAP connects to the C&O Canal Towpath and runs all the way to Washington, D.C. The GAP is an easily accessible trail with fantastic scenery of Southwestern Pennsylvania's rivers and mountains. From Ohiopyle, you can ride north or south however far you'd like to cross bridges, see waterfalls and take side-hikes to fabulous overlooks in the glorious Laurel Highlands. Ohiopyle, PA bike rentals: You can rent a bike from the Wilderness Voyageurs bike shop, then head out for a spin on the GAP. After your ride, take a lunch or dinner break at the Falls City Restaurant and Pub — we serve great food, and beer is a fantastic recovery drink! 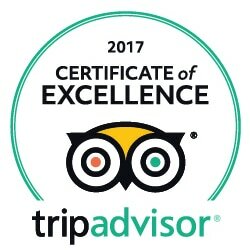 Great Allegheny Passage guided tours: Wilderness Voyageurs also offers guided tours on the Great Allegheny Passage, so you can experience the beauty of this rail-trail from end to end. The daily mileage is 30-45 miles a day so you can relax, take in the sights and enjoy the ride! The crushed limestone surface holds up well under traffic and generally provides a smooth ride. A strong group of volunteers maintains the trail from erosion fallen trees, so there are few obstacles. Near Pittsburgh, there are about 15 miles of paved trail and a couple miles of asphalt close to Cumberland. If you plan to ride all the C&O Canal Towpath to Washington, D.C., expect a less-improved, dirt road surface with potholes, tree roots, and mud. Most of the trail is converted from abandoned rail beds, which makes for a nearly level riding surface with the average grade of less than 1%. The steepest eastbound grade — 0.8% — is from Harnedsville to Markleton and Garrett to Deal. The steepest westbound grade is from Cumberland to Deal at 1.75%. The high point of the trail is where it crosses the Eastern Continental Divide near Deal (2375 feet). From the Eastern Continental Divide heading towards C&O Canal, the trail drops 1754 feet in 24 miles to reach Cumberland and, going west, it drops 1664 feet in 126 miles to reach Pittsburgh. The trail is so gradual that most people hardly notice these elevation changes. Any kind of bike can navigate the crushed limestone surface. That said, the most popular bike to ride is a hybrid, because the more upright riding position tends to be more comfortable and the tire size handles small bumps easily.